Niseko, on Japan’s northernmost island of Hokkaido, is a contender for one of the snowiest places on Earth. Unsurprisingly, this makes the premiere Japanese destination for the international ski community. While you’re enjoying one of the best powder resorts in the world, it doesn’t mean that you have to spend your whole trip on the slopes. In fact, if you’re looking for what to do in Niseko when you’re not skiing, you’re in luck, as the area also boasts a wealth of amazing cultural experiences that are easily accessible. Here at Japan Objects we’ve hand-picked the best experiences to be had off the slopes in and around Niseko! Knocking off early today? If you leave the slopes at lunchtime, don’t worry, you won’t have to spend the rest of the day in your hotel room. There’s plenty of things to do in Niseko to keep you occupied for the rest of the day if you’re not skiing. Check out these suggestions for some great ways to spend the afternoon. 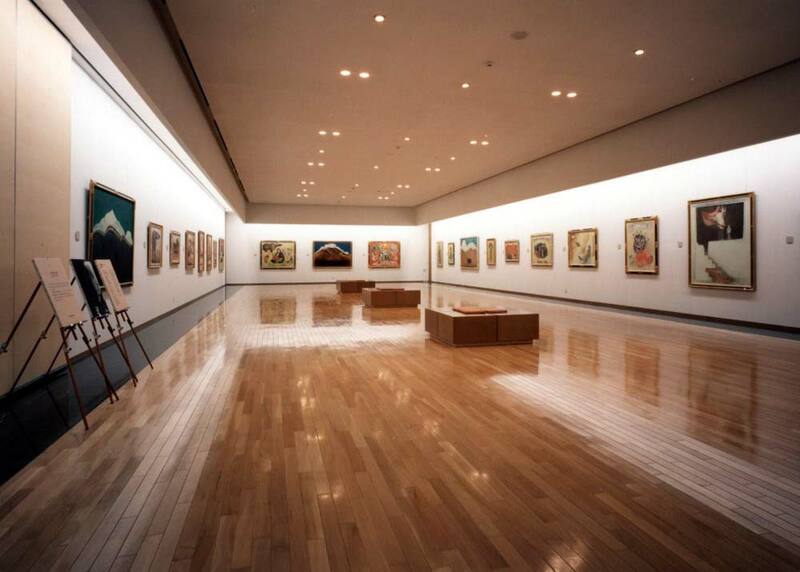 The Shu Ogawara Art Museum honors the life and work of Ogawara, a local artist who spent most of his career working in the greater Niseko area. He was no hermit, however, and his frequent travels around India and Tibet are reflected in the unique impressionistic art on view. The museum opened in 1991, and was designed to blend in with the landscape (see map). The large bay windows look out across the fields to a breath-taking view of Mount Yotei, which would make it worth the visit by itself. Admission is ¥500 ($4.50), which includes free entry to the next-door Kutchan Natural History Museum. Open 9-4:30, except Tuesdays. Set in a 150 year old Japanese traditional Kominka home, Somoza offers one of the great art experiences in Hokkaido (see map). Featuring finely curated exhibits of great Japanese artists, visitors can peruse the art and purchase pieces that speak to them. The space is also used for excellent seminars, classes, and hands-on cultural experiences in addition to a great restaurant that focuses on using the freshest ingredients from local sources. Each sitting can only accommodate 12 people so make sure you reserve early. You’ll want a seat by the window to watch the little stream wind its way through the snowy forest in the valley below you. Visiting an onsen, a Japanese hot spring, is an essential winter experience and the best way to relax those heavy, tired powder legs after several days on the slopes. The Green Leaf Hotel and Yugokorotei are a couple of the best onsens in Niseko. The natural ambience of Green Leaf Hotel Onsen (see map here) makes it a must visit for those keen on a soak. The outdoor bath is surrounded by boulders and pine trees, creating a truly unique forest experience, especially during a snowfall. Guests at the hotel can also access another great onsen and the nearby Hilton Hotel. Yugokorotei Onsen (see map) is one of the most popular onsens among international visitors, with a fusion of Japanese, western, and oriental style rooms. The natural spring water in these pools is pumped from the southern foothills of Mount Annupuri, and claims an impressive array of health benefits. What’s a trip to faraway Japan without buying something special to commemorate your voyage? There are some excellent places to shop in Niseko when you’re not skiing, but the following spots are our top picks when it comes to unique Japanese objects! Katachi is an art gallery featuring talented Niseko artists. It’s a must visit for those interested in the Japanese arts or simply keen on window shopping. Located in Upper Hirafu (see map), this gallery is easily accessible even on the walk to or from skiing. In the market for Japanese cooking knives? A Samurai sword? Vintage tobacco pipes? Cocoroya Niseko has you covered. Sitting in the center of town in Hirafu-Niseko (see map), Cocoroya offers thousands of unique Japanese objects perfect for your mantle at home. Stop in to peruse, and bring your passport, as the entire store is tax free for tourists! No discussion of Niseko’s après-ski activities would be complete without mention of what to do in the evening in Niseko. The town is the king of nightlife among Japanese resorts, having more bars and restaurants than any other resort in the country, and so many varieties that you will never be found wanting. From glorious seafood to mouth-watering Japanese noodles, exploring some of the best bars and restaurants in Niseko should be a major part of your trip. Be warned that in peak skiing season, the best spots fill up quickly, so you really should consider booking dinner in advance. One enjoyable destination for dinner is the Ezo Seafoods Oyster Bar (map), which serves up the town’s freshest seafood in a fascinating fushion style. If it’s more traditional Japanese cuisine you’re after, then try Ginrei Udon (map) or Teuchi Soba (map) for lunch, or try the Niseko exclusive potato ramen at Ramen Kazahana (map) for dinner! After dinner, slip through the tiny door of Bar Gyu+ (map) for some great cocktails at this Niseko institution of 20 years standing. For those looking to party in style, look no further than the Powder Room (map). This establishment is the premiere nightlife destination, frequented by fashionistas, celebrities and models alike! Neighboring Kutchan town has some great options too, such as the cozy Sekka Lab restaurant and wine bar (map), serving up innovative yet heart-warming Italian food. You’ve spent a few days enjoying the soft snow on the mountain, but maybe you’re feeling like you need a day off. Well if you’re looking for the best places to go near Niseko if you’re not skiing, why not head north to Otaru, or south to Toyako? Both towns are within 90 minutes drive of Niseko (although make sure you drive very slowly in the snow), while Otaru is also served by a very convenient train. And of course, Sapporo, the island capital, has plenty to keep you entertained - start with these Cool Things to Do in Sapporo if You Love Art! This picturesque onsen town is dominated by a large active volcano and serene lake, making it a must visit for nature enthusiasts and those simply looking to relax after a long week on the slopes. Find it on the map here. If you’re interested in other stunning locations to enjoy the winter weather in Japan, check out our recommendations of the Best Snow Towns in the country. What to Do in Toyako? Mount Usu, which last erupted in 2000, and the beautiful Lake Toya are best appreciated by taking the Usuzan Ropeway (see map) to the Toya observation deck and the Usu Crater Basin Observation Deck. From these areas you will have amazing views of the scenery and close access to an active volcano. The return ticket costs ¥1,600 (about $15) and the entire trip will take about 90 minutes. One of the most spectacular onsen views, perhaps in all of Japan, is from the 9th floor of the open-air onsen at Toya Kohantei (see map). Sitting atop a luxury spa, bathers can enjoy the unbelievable views of Lake Toya, Mount Yotei, and Nakajima Island while bathing in rich mineral water. If you imagine yourself isolated up in the mountains, then you may be surprised to come across the luxurious Michel Bras Restaurant at the Windsor Hotel (see map). The dishes are as much art as they are delicious, stimulating the senses and leaving you happy. It’s from this attention to detail that the restaurant received two Michelin stars. While dinner at the restaurant is expensive, it is a culinary experience hard to find anywhere else in Japan. Clinging to the rugged Hokkaido coast, just south of the city of Sapporo, Otaru is famous for its perfectly preserved historic buildings and irresistible seafood. It’s an easy 90 minute drive, or a direct train from any of the stations in the Niseko area. See the map here. What to Do in Otaru? Otaru’s architectural grandeur dates back to the late 19th century. The imposing stone banks, and European-style brick warehouses along the canal have been beautifully preserved, and today many have been transformed into shops, galleries and restaurants. Try Otaru Times Garten for example, where you can relax in a hammock with a cup of coffee and watch the winter snow fall on the canal outside (see map). Otaru’s Sakaimachi Street contains some shopping gems. Not to be missed is Kitaichi Glass (see map), which sells its own brand of historic Otaru glassware here and nowhere else in the world. What to Eat in Otaru? The cold waters around Hokkaido are rich with delicious seafood, and you can enjoy its bounty all over Otaru. The Takinami Shokudo in the Sankaku Market (see map) is the perfect place to enjoy local delicacies like ikura-don, salmon eggs over rice, or the huge king crabs. You’ll also be paying less than half the price you can expect to find in Niseko! If you’re here between February 8-17, you will also be lucky enough to catch the Otaru Snow Light Path Festival. The main light display takes place around the Otaru Canal where lights and candles are suspended over the water and placed within ice and snow sculptures on both banks. The whole town rallies together to create a glorious festival. Local people build their own light displays, sculptures, and snow mazes for visitors to enjoy. Wander around town with a cup of warm wine or sake, and a camera, and take in the breathtaking beauty of a town united in snowy celebration. Otaru is a great place to spend a couple of days, and we have lots more suggestions for what you can do there: check out Two Perfect Days in Otaru on Your Hokkaido Vacation! Otaru isn’t the only town celebrating the snow. On your way to or from Niseko, you should make a stopover in the regional capital Sapporo. If you’re arriving between now and February 12, you will also be able to catch the Sapporo Yuki Matsuri (Sapporo Snow Festival). Sapporo comes to life at this time hosting the world’s premiere winter festival. In fact, as many as 2 million visitors arrive each year! There are several sites throughout the city but the main attraction is Odori Park (see map), which runs through the heart of Sapporo for 12 city blocks. Here visitors will find massive snow sculptures (some 45 feet in height! ), stages built of ice and snow with live music, half pipes for boarders and skiers, food, drinks, and so much more. The amazing sculptures are illuminated in the evening until 11pm creating breathtaking visuals and an intimate atmosphere. To find out more about skiing in Niseko, including weather forecasts, resort information and more visit Mountainwatch. You can also check out our Top Tips on Planning Your Ski Trip to Japan. What do you do in Niseko when you’re not skiing? Let us know in the comments below!